It’s a national phenomenon, and it’s found a home at the University of Baltimore! It’s entrepreneurship and it’s growing stronger everyday, not just in the Merrick School of Business but all across campus. This movement has inspired hundreds of students, professors, alumni, and UB supporters. Take local entrepreneurs Phyllis and Leonard Attman, who saw this wave of entrepreneurial enthusiasm overtaking UB, and were inspired to assist the University’s entrepreneurial ecosystem with a significant gift that is contributing to students’ and alumni’s new ventures. This fall, UB’s Center for Entrepreneurship and Innovation held the annual Attman Competitive Business Prize competition for the first time. Twenty-five UB students and alumni applied for the competition, and six were selected to present their ideas for judging by the Attmans, their daughter Wende Levitz, and three volunteer experts, including Jeff Elkin, President of Advance Business Systems, L. Content McLaughlin (B.A. ’99, J.D. ’03, L.L.M. ’05), Founder of the McLaughlin Law Firm, and Scott M. Cotter, Vice President of Evergreen Advisors. The event took place on campus on Nov. 18 as part of UB’s celebration of Global Entrepreneurship Week. After getting a feel for the competitors’ business ideas, the judges selected one winner of the top prize of $2,500 in cash and $8,500 in donated professional services amenities and labor. Chris Wilson, a student enrolled in the University’s elite Entrepreneurship Fellows program, pitched one of his three businesses, The Barclay Investment Corporation, to the panel of judges, plus an audience of students, faculty, staff, and alumni. This Baltimore- based business, a social enterprise specializing in residential and commercial contracting work, was declared the winner. 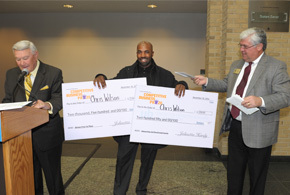 In addition to winning the grand prize, Wilson was awarded the crowd favorite prize and an additional $250. For the judges, it wasn’t the work of Barclay Investment that made it a stand out. It was the company’s mission, its vision and philosophy, and Wilson’s passion for strengthening the potential of people who come from neighborhoods troubled by low employment, poverty, and violence. Wilson’s employees live in these disadvantaged communities, mostly in the Barclay area of Northwest Baltimore, where dependable work is hard to find. They often have personal backgrounds that make securing a job a long-term challenge. Wilson says many of them have been incarcerated, had substance abuse issues or are perpetually down on their luck—no one has invested in them or their neighborhoods in a very long time. Wilson’s understanding of this goes deeper than boss-to-employee. He has faced adversity himself, and has come to realize that all kinds of men and women just need a chance—or a second chance—to get on a better path. Now, with the Attman Prize in his pocket, he is poised to do even more work that will transform his life—and in a domino effect, change in the lives of others. This year, six finalists competed for a total of $3,250 in seed funding and up to $16,000 gift-in-kind professional services. In-kind services have been generously provided by Katz Abosch, SalesBrewers, McKinley Media Group, and McLaughlin Law Firm. Other Attman Prize competitors included: Patrick Martin (runner-up, presented with $500 in cash and $2,700 in donated services), Jacob Harryman, Wagas Janjari, Michael Onuoha, and Walter Price.